17 May 2016, at 12:00a.m. With recent commitments from many of the largest Canadian food companies to only source cage-free eggs in the near future, the issue of whether conventional cages will disappear on Canadian egg farms seems to be sorted for good, writes Treena Hein. However, questions on whether Canadian egg farmers will be able to meet the deadlines of food companies – and whether or not any significant number of Canadian hens will be housed in “enriched” cage-free facilities – still remain unanswered. Commitments from companies began fast and furiously last year, with major food-makers such as Kraft Foods and national retailer Costco. The food service sector was not to be excluded, joining in with timelines that have surprised many. For example in October, Starbucks announced 2020 as its completely cage-free egg sourcing goal. In September, McDonald’s committed to fully transitioning to cage-free eggs for its nearly 16,000 restaurants in the US and Canada by 2025. The year finished with yet another major fast food chain Subway joining in, and 2016 began with Wendy’s adding itself to the list. In February 2016, the company that owns well-known Canadian restaurant chains Harvey’s, Swiss Chalet, Kelsey’s and East Side Mario’s committed to cage-free eggs by 2020. Around that point, the parent company of two other large chains, Tim Hortons and Burger King, pledged to serve only cage-free eggs by 2025 at all locations in Canada, the US and Mexico. In early March, A&W announced that it would become the first Canadian national fast food restaurant to serve eggs from hens raised in “better” cage-free housing within the next two years (more on the “better” bit later). Also in March, the Retail Council of Canada (which represents 90 per cent of Canada's grocery companies, including Loblaw, Metro, Sobeys and Wal-Mart Canada) stepped in. Cage-free housing now seems inevitable, but timelines may be a big sticking point. Canada has a supply-management system that prohibits import of eggs. Currently, about 90 per cent of Canada’s eggs are laid by hens housed in battery cages. The other 10 per cent of hens are housed in enriched, free-run, free-range or aviary facilities (see box for descriptions). Canadian consumers pay much more for cage-free eggs. In Eastern Ontario, for example, the cost of cage-free/free-run eggs is at least $5.30, while battery-cage eggs sell for only $2.80. Eggs Farmers of Canada (EFC, the national association representing all egg farmers) has currently committed to reach 50 per cent cage-free production within eight years (2024), to reach 85 per cent within 15 years and to have all hens in enriched or cage-free housing by 2036. This, however, does not line up well with the Retail Council of Canada’s voluntary commitment to buy only cage-free eggs by the end of 2025 (in nine years). David Wilkes, the Council’s senior vice-president of government relations and its grocery division, says his organisation has reached out to EFC and “will continue to work with them” to meet the Council’s 2025 commitment. Mr Wilkes says the Council is supportive only of cage-free housing over any other type of housing because that position is in line with the expectations of consumers and other major players in the food industry marketplace. When asked which housing system EFC officially supports, the organisation first points to research showing that all egg production systems have trade-offs across a host of factors, including animal health and well-being, environment, food safety, worker health and safety and food affordability – but then focusses in on only one system. 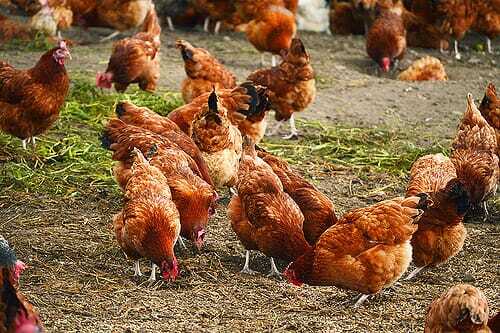 “Enriched housing provides the benefits afforded by conventional production, plus additional features that allow hens to exhibit specific behaviours which may include perching, scratching and nesting,” said EFC’s CEO Tim Lambert. He added: “EFC supports enriched housing as one of the alternative housing systems to be pursued in the transition from conventional to other housing systems. Any attempt to convince the food industry of the merits of enriched housing may be a losing battle, however. Studies have found that consumers neither understand the difference between battery cages and larger enriched cages, nor are they willing to pay more for enriched eggs. Marion Gross, senior vice president of supply chain management for McDonald’s USA, may have summed it up best with her statement in January in the Chicago Tribune: “Enriched [housing] doesn't mean anything to our customers, but they know what cage-free means." The NFACC describes itself as the only organisation in the world that brings together animal welfare groups, enforcement, government and farmers under a collective decision-making model for advancing farm animal welfare. It already has, or is currently producing, ‘Codes of Practice’ (guidelines for animal care requirements) for all farmed animals in Canada. NFACC General Manager Jackie Wepruk says the draft layer hen ‘Code of Practice’ will be released for public comment later this month (May 2016). Whatever the Code states, whether enough Canadian farmers will convert to cage-free – or enriched cage free – in time to meet food industry deadlines remains to be seen. The hen will be sitting on that egg for some time to come. Conventional battery cages are small cages with an area about the size of a sheet of paper allotted for each hen. They will be completely phased out by 2036. Enriched (also called furnished) systems house dozens of hens in larger cages, with features that allow them to exhibit natural behaviours like dust bathing, perching and laying eggs in some degree of privacy. Dust and ammonia levels are lower than in any type of cage-free system. Critics of enriched housing say there isn’t enough room in these types of housing for hens to truly exhibit natural behaviours. 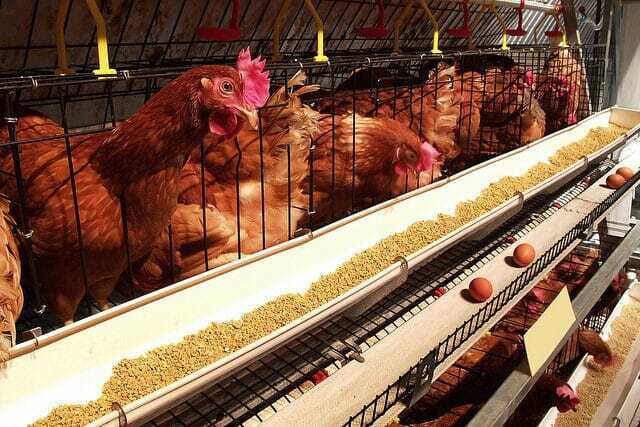 Cage-Free/Free-run: Chickens are housed freely inside a barn. Higher dust, ammonia and cannibalism levels than enriched or aviary systems. Cage-free/Free-range: Similar to free-run but during warmer months of the year when weather permits, hens roam in an attached outdoor enclosure. All certified organic eggs in Canada are from hens housed in free-range facilities. Aviary: Multi-tier cage-free/free-run systems where hens can flap their wings, walk and jump. Aviaries have roughly 1.5 times more space per bird than enriched systems. There is a higher risk of bone fractures than with single-level barns. On the University of Guelph’s (Guelph, Ontario) website, poultry welfare researchers point out recent evidence indicating “that the incidence of keel fractures in non-cage systems ranges from 52 to 80 per cent. Such fractures are likely to be painful. Furthermore, keel fractures compromise the birds’ mobility.” (The keel is the straight bone that projects the length of the sternum.) Critics of aviary (and enriched) housing also say there isn’t enough room in these types of housing for hens to truly exhibit natural behaviours.